A pamphlet handed out by Game Workers Unite at GDC 2018. SAN FRANCISCO—In a small room yesterday inside the massive Moscone Center meeting complex, roughly 200 people crowded around a large table to conduct a challenging conversation about working in the video game industry. There was a single microphone, chauffeured from person to person by a sprinting staffer working the Game Developers Conference, which is running in town all week. Most people began talking before the mic got to them. Raucous banging, presumably from construction nearby, drowned out many attendees’ comments. Despite the din, the buzz in the room was apparent: People were ready for change. They were there for a roundtable, led and moderated by the International Game Developer Association’s Jen MacLean, titled “Union Now? Pros, Cons, and Consequences of Unionization.” Over the course of an hour, only one person in the room mentioned the cons and consequences: MacLean. As the microphone moved from speaker to speaker, the room heard argument after argument in favor of unionization. Every single one was met with applause. One person talked about unions putting an end to exploitative internship programs. Another said they expected a union would protect marginalized members of the community. “If you’re not at the table, you’re essentially on the menu,” said Steve Kaplan, a union organizer for the International Alliance of Theatrical Stage Employees in Los Angeles, to clapping and cheering. Maclean, whose organization works to “advance the careers and enhance the lives of game developers,” responded to each point with questions, asking if the audience really thought a union would solve all of these problems and repeating several times that she felt it was important to have these discussions. Game developers have discussed unionization in the past, but at GDC 2018, the notion has more momentum than we’ve seen in modern times. 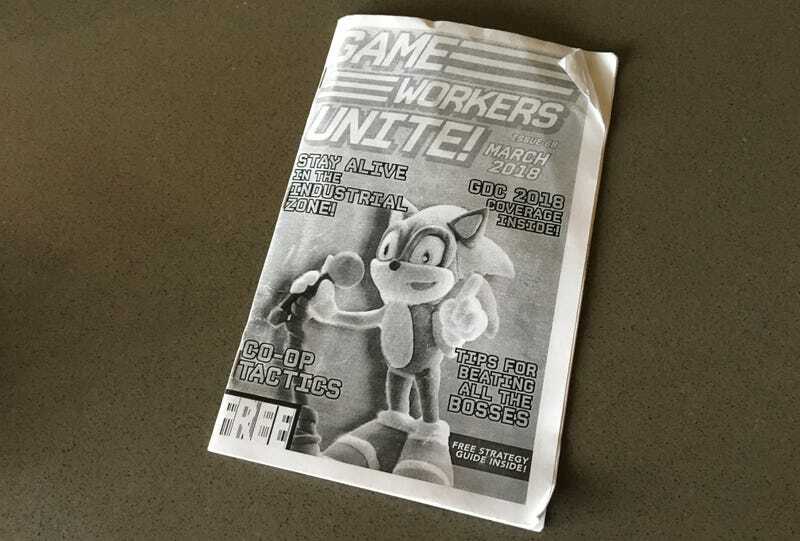 A group called Game Workers Unite, in large part inspired by MacLean’s roundtable, has passed out buttons and zines, started social media campaigns, and helped drive conversations all across the world’s largest conference for video game developers. In crowded hallways during the day and dive bars at night, developers are suddenly talking about organizing—about how it might happen, whether it’s a good idea, and what it might look like. There are no hard numbers to indicate how many experienced developers have burnt out and left because of the lifestyle, but there are plenty of anecdotes. Here’s one I heard recently, from several people who work in video games around the Bay Area. When EA shut down Visceral Games last fall, publishers like Ubisoft and 2K held recruiting events and reached out to former Visceral employees with offers. Some of those people took jobs in games. But many others—by one estimate, nearly half of Visceral’s former staff—instead moved to companies like Facebook and Google, where they’d receive high six-figure salaries and not have to deal with the volatility of the video game industry. Talk to enough game developers and you’ll hear anecdotes like that all the time. Emma told me that Games Workers Unite started as a conversation between a few lefty game developers before ballooning into a Discord with hundreds of members (across big-budget, indie, and mobile gaming, Emma says) and a Twitter feed with thousands of followers. Now, she says, she wants to turn it into a labor organization that provides resources for workers who want to unionize. She said she thinks we might see at least one company vote to organize within the next few months, although that might be too optimistic. In 2016, according to SEC filings, Activision-Blizzard CEO Bobby Kotick made $33,065,560 in salary and stock compensation. In February of 2017, despite surpassing its revenue targets, Activision laid off hundreds of workers at Infinity Ward, Beenox, and other internal studios. Those workers’ wages varied, but a 2014 survey from the gaming trade website Gamasutra pegged the average game developer’s salary at $83,060, or 1/398th of what Kotick made. Massive wage disparity is not exclusive to the video game industry. But workers in the video game industry don’t have the same leverage that they might in other fields, such as film, which is heavily unionized. Game developers have no protection against the whims of executives and shareholders, and they have no way to fight back against crunch, layoffs, and abuse. Even Jen MacLean, the roundtable’s organizer who has pushed back against the idea of unionization, told me Tuesday that she believes video game workers have been mistreated. At MacLean’s roundtable, many attendees told horror stories from the video game industry. One said they had worked so hard, they burnt out of video games entirely; another said they crunched nine months straight and received a single week of paid time off afterward. All suggested that unionizing could help solve these problems, although there was disagreement on the method. At one point, MacLean brought up her own horror story, about a plumber’s union in Philadelphia that fought against Comcast because the cable titan wanted to install environment-friendly waterless urinals in their new building. The plumber’s union, recognizing that waterless urinals would lead to less work for their employees, fought to convince Comcast to add extra pipes to the walls. This sort of story—where a union is bureaucratic to a fault—is a common argument against unions. Much of MacLean’s rhetoric followed a similar pattern. While talking to me Tuesday and at the roundtable yesterday, she brought up the notion that a union can’t fix everything. “To assume that suddenly if you unionize, everything will be great, I don’t think that is a reasonable assumption,” she told me. In early 2016, Kotaku’s former parent company Gawker Media became the first digital media company to organize, voting overwhelmingly in favor of unionization alongside the Writer’s Guild. At first I was skeptical of this effort, not knowing much about unions and assuming that they would lead to bureaucracy and rigidity. As I got more involved with the process, however, it became clear that organizing would allow us to bargain in whatever way we chose. We didn’t want to fight for “just cause,” for example, because we believed that editors-in-chief across our sites should have the flexibility to hire and fire whoever they wanted. But we did fight for salary floors, benefit protections, and rights to reuse our work. We carved a contract that we felt was best for the writers and editors of Kotaku, Gawker, Deadspin, Jezebel, Gizmodo, Lifehacker, and Jalopnik. If developers organized on a studio level, they could take a similar approach, bargaining collectively for what was best for their workforce. What works at Naughty Dog in Los Angeles might not work at Ubisoft Montreal. Priorities at Obsidian might be different than priorities at DICE, and the rules for unions might necessarily differ between an American studio and a Swedish one. If a studio’s workforce decided that they were OK with rampant overtime, then maybe they wouldn’t bargain for hour maximums, but instead they’d fight to ensure that overtime was paid. Maybe they’d negotiate for salary minimums, flat bonuses, and other measures to encourage fairness and transparency. Discussions of crunch can be nuanced (and it’s hard to find anyone who’d complain about an occasional long night or weekend at work) but the ethics of overtime pay are clear. Other models of unionizing in the video game industry, like organizing by discipline or by region, could also prove effective, although unionizing by studio seems more feasible to me. Cultures at different studios are too different for a one-size-fits-all approach to work, and tensions would run high if the artists at any given studio were organized but the programmers weren’t. Arguments against organizing have been fatalistic. Some have pointed out that if studios unionized, then big game publishers would move to outsourcing or work with non-union studios. Sure. But nothing is preventing those publishers from moving to outsourcing right now, and when non-union studios see the benefits gained from organizing, they’ll follow suit. As the IATSE’s Steve Kaplan noted during yesterday’s roundtable, the first studio to unionize will be the first domino in the chain. That’s what happened for us. After Gawker Media unionized, Vice, Vox, and Salon followed. It always starts with one. Across the video game industry, there’s widespread interest in organization. A 2014 IGDA survey found that 56% of 2,200 polled developers would be in favor of unionizing. Groups like Game Workers Unite helping spread information and correct misconceptions will only increase that number. Unionization will take a very long time and face quite a few hurdles, but if it doesn’t happen, the consequences may be dire. There’s no other way for game developers to cultivate leverage against people who want to exploit them. And the current trajectory of the video game industry seems unsustainable if something doesn’t change.